OK –IT’S NOT THE MOST FESTIVE DRINK FOR THE HOLIDAYS. BUT, WITH ALL OF THAT CELEBRATING GOING ON, OUR BODIES COULD PROBABLY USE A LITTLE BREAK. And, it’s a much higher quality, way more delicious and nutritious drink than what you buy in that box at the grocery store. Which, by the way, using THE MOST POPULAR BRAND, ALMOND BREEZE, IS BASICALLY 2% ALMONDS AND 98% WATER! with additives like sunflower lecithin, sugar and carrageenan. 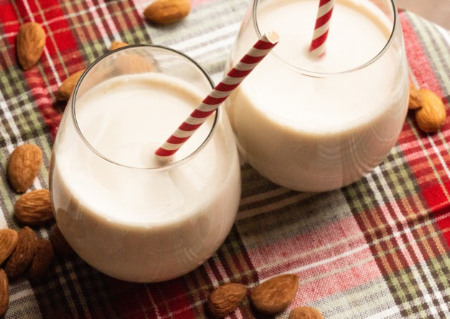 So, why spend a lot of money on a doctored, watered-down version?-- when you can spend just pennies and have almond milk that is so much better in every way? IT’S SUPER EASY TO MAKE. There are just two things you have to do. First, you’ve got to plan ahead because the raw almonds need a good soak overnight, or at least 8 hours. Second, you’ll need a reusable nut bag. (around $10 on Amazon or in your local grocery or health food store—well worth it! ), or a few pieces of cheesecloth. ONCE THEY’RE SOAKED, JUST DRAIN AND THROW THEM IN THE BLENDER, preferably high speed, with water, and if you like, a few dates, a splash of vanilla, STRAIN AND VOILA!---a creamy, delicious milk substitute. Use it as you would dairy-- on cereal, in your coffee or tea, in smoothies, dairy-free puddings, ice cream, soups, sauces or salad dressings. You can even use it as a milk replacement in many baked goods. I like to simply drink it by the glassful. YUMMY! 1. Buy whole raw almonds (with the skins on), organic if you can. Not anything roasted or salted. 2. If you have a regular blender, blend smaller amounts and combine. Even in the high speed blender, I like to blend all of the nuts with 1/2 of the water first before adding the rest. 3. This will only last about 3 days in the fridge, so I make this smaller amount, but if you can use it all up, feel free to double the recipe. 4. If using a nut bag to strain the liquid, make sure to clean it right after you use it to keep it unclogged. In a medium-sized covered container, add the almonds and enough water to cover at least an inch above the nuts. Let the nuts soak overnight in the fridge, or for at least 8 hours. Drain the nuts, and add them with the dates and vanilla, if using, into a blender, preferably high-speed. If you’re using a regular blender or a something like a bullet, only blend one half of the nuts and water at a time, and then combine in the nut bag. Blend for 2-3 minutes. Place a nut bag, or a few sheets of cheesecloth into a medium-size bowl. Pour the blended nuts into the bag, and squeeze all of the liquid into the bowl. Pour into a container and chill. Immediately rinse out the nut bag to keep it unclogged. The milk will last for up to 3 days in the fridge. You can easily double the recipe. But, it’s best to make less more often. Makes about 2 1/2 cups. YUM!